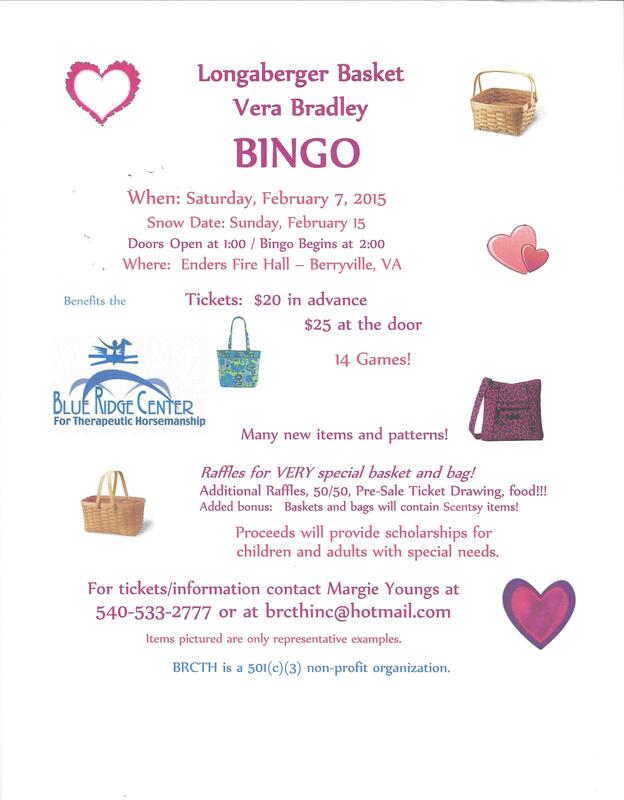 Saturday, March 2nd – Vera Bradley, Thirty-One and Premier Jewelry BINGO at John Enders Fire Hall in Berryville, VA. Doors open at 1:00 and Games start at 2:00. $20 in advance or $25 at the door. 14 prize-filled games, raffle for very special 3-product Grand Prize, raffles for 50/50 and Themed Baskets too! Chili, hot dogs, snacks, baked goods and beverages for sale. This is a community bingo event, open to novice bingo players as well as experience players. Download the . Tickets can be purchased online or by contacting us at 540-533-2777 or at brcthinc@hotmail.com. Check back with us from time to time for updates, and also visit AND LIKE our Facebook page!